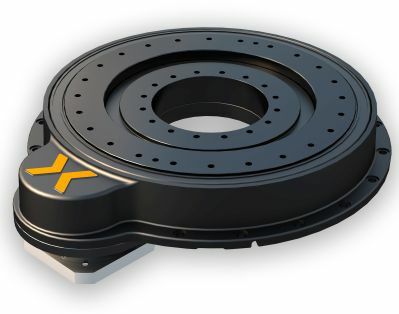 Nexen Group, Inc. introduces the Motor Ready Sealed (MRS) precision rotary indexer. The MRS maintains the benefits of the company's existing patented precision roller pinion drive design -- zero backlash, high precision, high torque, and high acceleration -- while delivering significant new benefits. A high roller pinion-to-gear ratio allows users to direct drive the system with the addition of a servo motor -- eliminating the cost of a reducer. This also reduces engineering and installation time. For high load applications, the customer can drive the system with a reducer/motor combination. Additionally, the gear-to-pinion reaction loads are fully supported so the servo motor shaft is not subjected to radial loading, which eliminates the need for costly high output capacity reducers in high load applications. All of these features reduce engineering and installation time. The MRS is ideal for precision rotary indexing applications such as machine tool, semiconductors, robotics, automated welding, assembly, and cutting systems.